This diagram is an example of creating Dashboard Diagrams in Sparx Systems Enterprise Architect. The Dashboard Diagrams allow high quality charts and graphs to be created to display repository information in a visually compelling way, such as the ratio of Requirement Priorities in a pie chart. 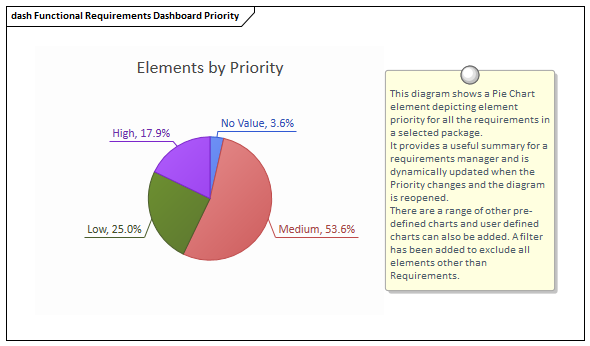 Dashboard diagrams present compelling views of information - such as the status of Requirements in a particular release of the system - that can be viewed inside the model or conveniently copied directly into management or project team presentations. They are useful for planning an iteration such as an Agile sprint to view how ready the Requirements are for the implementation team; for example to view what percentage of the Requirements have been approved and are of high priority.